Founded in 1929 as an aircraft manufacturer, Martin Baker evolved to become a designer, developer and manufacturer of aviation ejection seats, with the first mid-flight test ejection made on 24 July 1946. 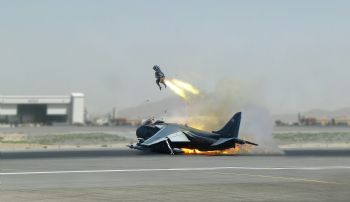 The first live non-test ejection was on 30 May 1949, since when the company’s ejection seats have saved 7,588 lives (as of 9 November 2018). Since 1946, Martin Baker has delivered more than 85,000 seats to 91 nations. There are more than 16,000 seats currently in service in 78 countries across 51 aircraft types; and with ejection seats in all areas of aviation (from helicopters and light ‘prop aircraft’ to fighter jets), the company currently produces more than 40 seats a month — plus various components for the maintenance and repair of seats that are already in service. Producing everything from spares for seats dating back to 1949 through to more than 700 parts for each Joint Strike Fighter (JSF) seat, Martin Baker has some 25,000 live components and more than 50,000 parts on its inventory list. The components are manufactured by 25 CNC machine tools at the company’s Uxbridge headquarters, at the heart of which is a four-machine 72-pallet cell from DMG Mori that runs 24hr a day, 364 days a year. Ensuring that all components conform to specification, 800-employee Martin Baker has an inspection department with 55 staff, who rely heavily on inspection equipment from Andover-based Mitutoyo (UK) Ltd (www.mitutoyo.co.uk). Inspection manager Darren Smith said: “Martin Baker has had a long association with Mitutoyo — more than 30 years — using hand tools such as micrometers, vernier calipers and height gauges, as well as CMMs. As our company has evolved, so has the inspection technology that we use. “We now have five Mitutoyo CMMs, three SurfTest machines, a Contracer, training kits, the Mitutoyo MeasurLink system for Statistical Process Control (SPC), and over 300 Mitutoyo hand-tools and gauges on-site — and for every challenge we have presented the company, it has come up with a solution. “Moreover, it is not just about the hardware; we also use the MeasurLink software to help us with our measurement system analysis program, and this allows us to gauge our R&R — repeatability and reproducibility — and SPC. Emphasis on GD&T Referring to the components manufactured at Martin Baker, Mr Smith said: “We have an ever increasing demand put upon us by our design department. From a hardware perspective, Martin Baker has two Crysta Apex 9206 CMMs in its inspection department, with another checking components at ‘goods in’; a smaller Crysta Apex 9106 CMM sits alongside the DMG Mori production cell on the shopfloor. The Uxbridge facility also has two CV3200 Contracer form-measuring machines for inspecting contours and profiles, as well as three SurfTest Extreme SV-3000 CNC surface-roughness-measuring machines. Each of the CMMs has a standardised and comprehensive rack of probes; these include Renishaw’s SP25 analogue scanning probe, along with the scanning software module that is part of the Mitutoyo M-COSMOS 3 software suite. For Martin Baker, the SP25 probe provides continuous contact with the workpiece, improving inspection cycle times while giving 100% inspection of free-form shapes. The SP25 analogue scanning technology also works “in complete synergy” with Mitutoyo’s CAT 1000PS surface analysis software — a CAD modelling suite that enables Martin Baker to rapidly load its CAD models directly to the CMM and overlay the CAD models with the path of the inspection probe. By selecting the most efficient probe paths and cycle routes, the CAT 1000PS technology has enabled Martin Baker to build a part library and continually optimise probing cycles. Commenting on the software implementation at Martin Baker, Mitutoyo technical sales representative Chris Pullen said: “The M-COSMOS 3 software suite that incorporates the CAT 1000PS technology has standardised processes and provided a uniform platform for measurement at Martin Baker, while also improving inspection cycle times and throughput. Furthermore, the ability to store a complete library of optimised programs creates a platform for historical and uniform inspection. “More recently, Martin Baker bought the latest edition of Mitutoyo’s MeasurLink software for SPC. Martin Baker is always considering the benefits offered by the latest developments, which is why the company recently added Mitutoyo’s U-Wave wireless technology; this enables equipment such as micrometers and vernier callipers to be connected wirelessly to the M-COSMOS 3 software to automatically generate uniform inspection reports on components, with the data and reporting presented on a ‘live’ platform that can be overseen by the inspection manager. Mr Smith said: “The ability to view inspection data relating to hundreds of parts and thousands of measurement parameters on a live basis enables us to monitor our SPC values against production and identify any deviation in production data.